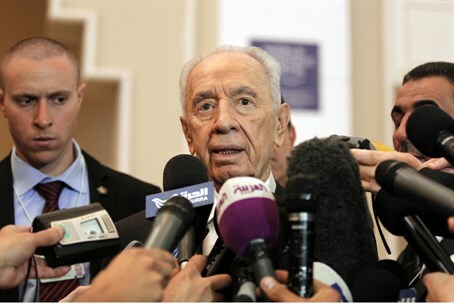 President Peres urges EU to freeze its boycott during talks, says EU support will help bring peace. The European Union should put its proposed boycott of Israeli businesses in Judea and Samaria on hold in order to help the diplomatic process, President Shimon Peres suggested Sunday in a meeting with German Foreign Minister Guido Westerwelle. Peres started by welcoming Westerwelle, and telling him that Israel appreciates the role Germany has played in both the Israel-Arab peace process and the attempts to stop those that pose a threat to it, such as Hizbullah and Iran. Talks between Israel and the Palestinian Authority are to begin in two days, according to Peres. Some people are skeptical about the results, he said, but he added that "moving backward is not an option." The EU decision essentially is a decision regarding the final borders between Israel and a future Arab state, he said, but that decision should be made during talks, at which point the EU ruling will in any case no longer be relevant. The EU’s support for Israel, and Germany’s support for Israel, is very important for the success of the peace talks, he added. Westerwelle congratulated Peres on the resumption of Israel-PA talks, and said Germany would do whatever it could to help move the process forward. The recent decision to end EU ties with Israelis in Judea and Samaria should not be seen as a change in EU policy regarding Israel, he said, maintaining that the EU seeks cooperation with Israel.